Ash Barker and his brother had just about built their ranch into a success when he busted his arm trying to tame a particularly nasty mustang. Now they’re headed into Cheyenne’s harsh winter with fewer hands, and a very real danger of failure. They need someone else—anyone else—out there with them, to make it through this season. Molly Murray’s dream of owning her own bakery went up in flames with the Great Chicago Fire. She’s been supporting her younger sisters for the last four years, and it seems like the Cheyenne wilderness might be her last chance to give them all a real home. But no one will hire her, until she meets the intimidatingly masculine, incredibly handsome, and very desperate Ash Barker. 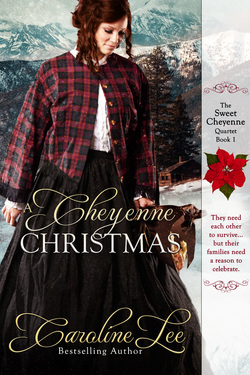 Can their unique families blend in time to celebrate their first real Cheyenne Christmas? 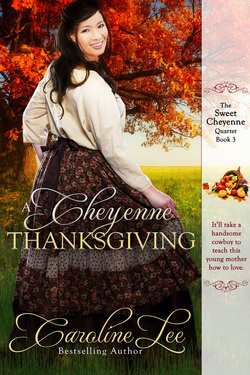 Circumstances dictate that Serena Selkirk must choose between two very different men for a husband: her coarsely handsome rancher neighbor, and a sophisticated and urbane Cheyenne schoolteacher. Cam MacLeod and Sebastian Carderock embody opposing aspects of success in Wyoming, but both types of men are necessary for the Territory to become a state. And while Wyoming’s future hangs in the balance, so does Serena’s. She’ll have to decide between pragmatism and her dreams, but only one man will be able to make her truly happy. It will take a Fourth of July showdown for Serena to realize what her heart—and her future—really desires. When Cam MacLeod is attacked by a half-starved exotic beauty defending her son on the high Wyoming plains, he's understandably intrigued. And the more he learns about Tess, the more he begins to hope that he's found his chance at a ready-made family. He even manages to talk her into marrying him. Except for one small detail: Tess refuses to give him her love. If he can convince her that they were made for each other before the end of November, he'll have a reason to be truly thankful. Since being made a full partner in his brother's ranch, Nate Barker has grown into a savvy businessman, despite the savage taint of his Indian blood. But that success hasn’t eased the emptiness he’s felt since his best friend and childhood sweetheart Wendy left him to follow her dreams of becoming an author. It’s been almost four years since he last saw her, and he hasn’t been able to move on with his life. Now he’s determined to follow Wendy to St. Louis, and figure out if she ever loved him the way he loved—and still loves—her. Wendy Murray thinks she knows all about True Love; after all, she is a successful romance novelist. But life in the big city is more complicated than she expected, and now she has a terrible secret… A secret that’s kept her from going home to Nate. But when he shows up on her doorstep only a few days before Christmas, she knows that she can’t hide any longer. She might know all there is to know about writing romances, but Nate is determined to teach Wendy that “Happily Ever After” isn’t just a phrase out of one of her books. Things can never go back to the way they were… but with a little magic of the Christmas season, maybe they can be even better. 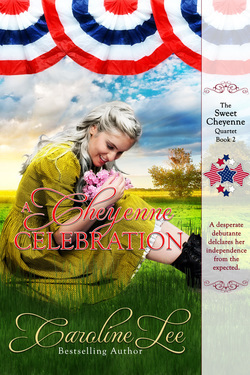 A 10,000-word collection of three short stories for fans of Caroline Lee's Sweet Cheyenne Quartet. These stories are meant to be read after the rest of the Quartet. Christmas Wishes: Molly struggles with her toddler's feelings towards his new baby brother and her sister's decision to leave for St. Louis. 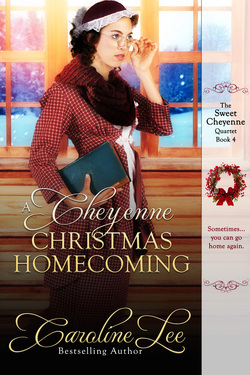 Meanwhile, she's determined to create the perfect Christmas for all of them... but can Mothers really do everything? Spring Fever: Wendy aches to become a mother, but their efforts have ended in heartbreak so far. Is there anything Nate can say to convince her that it isn't either of their faults, so that he can enjoy the spring with his wife? Summer Lovin': Tess knows she still has a month to go in this pregnancy, so when the contractions start, she doesn't want to alarm her precious family. But with Cam's love and support, she'll learn that to appreciate God's blessings she needs to first go through Hell.